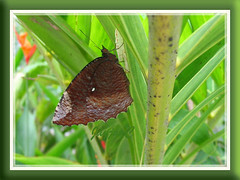 The Common Palmfly is a nymphalid butterfly that often visits our tropical garden, especially attracted by our potted palm trees, located at the frontyard as well as the backyard. Elymnias hypermnestra agina is a medium to large butterfly with a wingspan of about 6-8 cm. On the upperside, the butterfly is bluish-black with a series of blue to purple submarginal spots on the forewing, and purplish-brown on the hindwing. The underside has fabulous brown tones with subtle purplish-grey markings and a characteristic triangular shape in bright contrasting colors at the apex of the forewing. There is also a white spot in the center of the costa on the hindwing. The female resembles the male but is slightly larger, lighter in color and has a few whitish submarginal spots on the upper surface of the hindwings. Range: Sri Lanka and India to Taiwan and Indo-China, through Malaysia to the Lesser Sunda Islands and the Philippines. Food plants: Caterpillar feeds on the leaves of various Palm species of the plant family, Arecaceae (Palmae), especially Golden Cane Palm (Dypsis lutescens) and include Coconut (Cocos nucifera), Lady Palm (Rhapis excelsa), Manila Palm (Veitchia merrillii) and Macarthur Palm (Ptychosperma macarthurii).